We made a start on Saturday a little later than Friday, but still got there by 8am. By this point I had wised up and made a beeline to the free coffee van that MRT was sponsoring (cheers guys! ), where the gent was making us great coffee all weekend for a gold coin donation. Anyway, on to the pics! Cyber Evo was almost ready by this point. 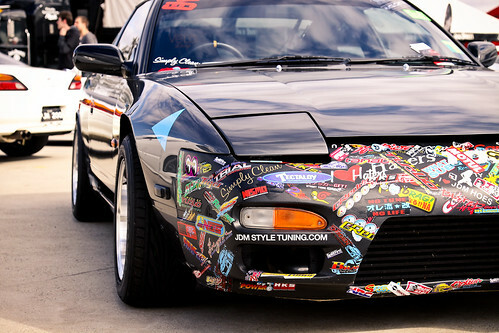 Check out the overfenders ON TOP of the widebody! 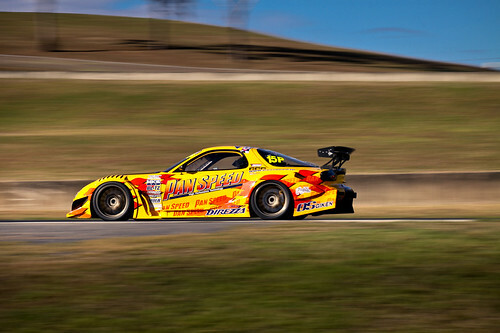 BSM Motorsport’s R32 GTR warming up/testing. 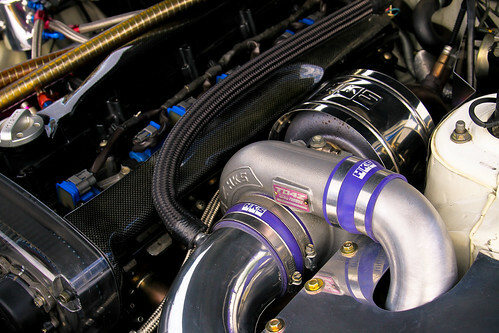 HKS T04Z, CF rocker covers! The Evos were absolutely smashing it, then the Sun Cyber Evo finally came out to play with Tarzan Yamada at the helm. To everyone’s surprise, they did a few laps, smashed the records, and went back in the pits. What? 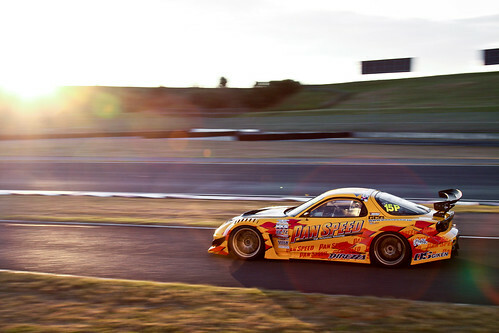 The other classes of racing were great also, with Queensland-based 999 Automotive‘s turbo-fed DC5 sounding the goods. By this time I was getting peckish, so I decided to wander through the show and shine section in the carpark, where I bumped into some lovely promo girls. Is there an age limit on promo modelling? …and the closing of racing for the weekend. I was sitting on turn one, just after the main straight for these. 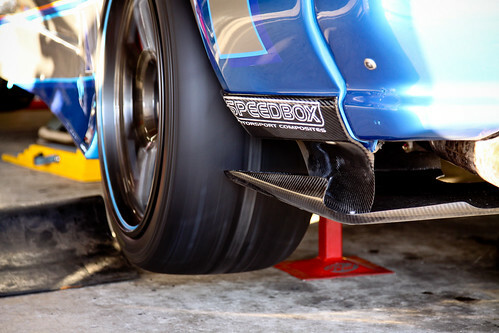 The pro cars were going through fresh rubber like it was going out of fashion – the white spot in this picture behind the car is the sticker off a brand new Advan semi-slick. 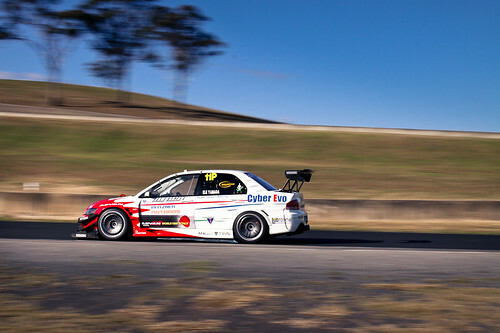 On the last lap, the Cyber Evo blasted down the straight, and the wing unexpetedly flew off the rear deck and into the air! 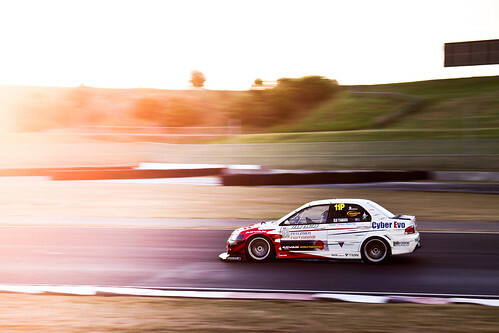 The car was visibly immediately tail happy, slipping and sliding all through turn one. 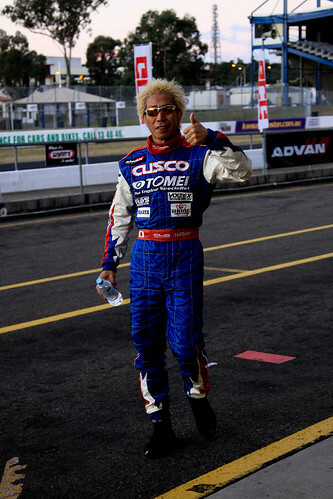 The day was taken out by Tarzan Yamada in the Sun Cyber Evo, running a blistering 1:30.587. 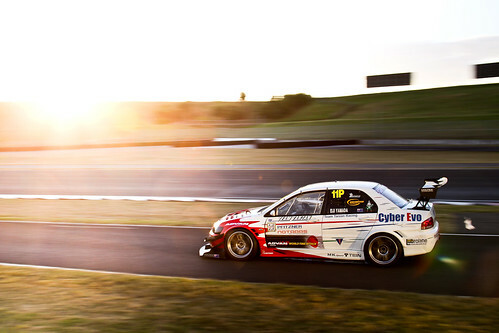 The Sierra Sierra Evo driven by David Emphringham placed second with a 1:31.884, and third was the Tomei Cusco WRX once again piloted by Yamada to a 1:31.901. Needless to say, he was quite pleased with himself. Fourth and fifth were Warren Luff in the Prep’d Lotus Elise and Kinoshita in the R-Magic FD, still with incredible lap times. 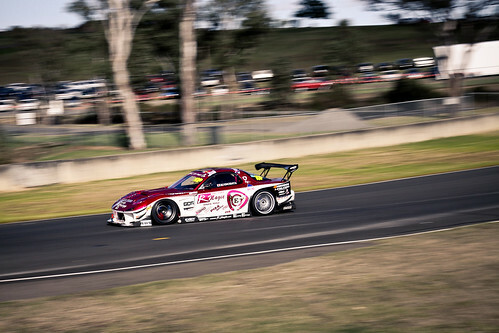 Somewhat disappointingly, Mark Berry placed 7th in his R34, 3.5 seconds off the pace of the Sun Evo..
Rest of the results are here. We decided to have our farewell dinner at about 9pm, but didn’t want to drive too far from our hotel, having another long day of driving ahead of us, back to Brisbane on Sunday. Being in the mood for anything but fast food, we searched around the area for a while, trying to find a restaurant that didn’t look TOO dodgy. Half an our later, we gave up the search and decided to just get a meal from the Imperial Hotel Family Bistro, which was basically the only thing open. In the forecourt was a hole in the wall serving Chinese/Asian food, so I got a plate of mongolian lamb with fried rice, and to my enormous surprise, it was amazing, and cost a grand total of $13 including a beer. Can’t complain about that! We went back to the hotel and crashed in readiness for another 14 hours of driving home on Sunday. I have a couple more pics from the drive home, but will add those later.